At only 3 km long by 2.5 km wide Shikinejima is one of the smaller Izu Islands, but what it lacks in size, it makes up with sizeable pockets of pristine nature. Like last year’s Mt. Tenjo hike on nearby Kozushima access to Shikinejima is met either by large passenger ship from Takeshiba pier or high-speed jet ferry. The overnight ship is great value at only 5,980-yen one way in a 2nd class cabin. In the off season you set up camp at the quaint Kamanoshita Campground and at other times at the Oura Campground. From Nobushi Port it’s a 20-minute walk up to the Kamanoshita campground. 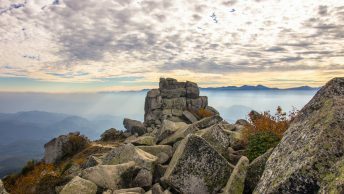 This scenic and family friendly coastal hike is part of the Fuji-Hakone-Izu National Park and begins from the Kamanoshita Campground. First head over to the Matasugashita miyabino-yu hot spring and look for a shortcut trail above the restroom. The trail pops out above the Ashitsuki hot spring. There is also a short detour up to the Ashiji-yama lookout 足地山展望台. Next head up the road, turn left and follow around to the start of the Mikama Bay Promenade trail 御釜湾遊歩道入口. The trail skirts around Mikama Bay 御釜湾 with several observation decks to take in the stunning ocean views. Next stop is the desolate looking Tojinzushiro 唐人津城 situated atop a cliff. The scenery here is not to dissimilar to the desert like landscape on Mt. Tenjo. Azaleas bloom in the spring and the area also sports the highest point on the island at 109 metres. Take care of the precipitous sea cliff if you intend to take a peek from this viewing point. From here it’s a 20-minute hike across to the Kanbiki Lookout 神引展望台. 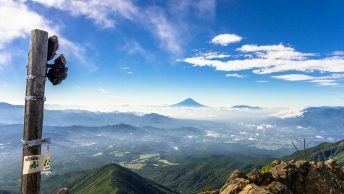 On clear days the Izu Peninsula and Fuji san are visible to the north along with Miyakejima and Mikurashima to the south and is one of Tokyo’s 100 best views. The final section follows the coastline down to Nakanoura Beach and finishes at Oura Beach.